Want to have a pretty baby? Doing like this! 1. Keep a good mood. The mood of pregnant women can affect the appearance of baby? The answer is yes. According to the doctor's introduction, baby can sense the mother's emotions, and can make a simple response to the mother's emotions. This is because the change of the hormone levels inside the mother can convey to the blood of the fetus through the placental barrier, and thus affect the baby. If the secretion of adrenaline and other hormones in the mother being at a high level in long-term, the secretion abnormality of hormone will occur in fetus. As a result, the supply of blood and nutrients of the fetus will be affected. The probability to give birth to deformed children will be greatly increased if the pregnant mother in a bad mood all the time. This is because the white blood cells in pregnant women will be greatly reduced if mother get angry, and endocrine dyscrasia will occur, the baby will be born out with frightened emotion, the baby's appearance will so be affected. Therefore, during pregnancy, the mother must learn to regulate their negative emotions, and maintain a pleasant mood. Fathers who have to understand the emotions of the wife, and give the wife more care. 2. Listen to more light music. Light music can make us relax and also able to stabilize the pregnant mother's emotions. If the Pregnant mother has good mood, the baby will naturally feel comfortable. So, it would be better to listen to more light music if mothers get fidgety during pregnancy. 3. See more photos of beautiful baby. There is a traditional approach like this: the first people first saw by the baby will affect the baby’s appearance. Therefore, many parents prefer to find a beautiful midwives. Although this is just a nonsense, however, the role of psychological suggestion is very strong. Therefore, pregnant mothers may wish to put some nice baby photos at home, and believe that they will be able to give birth to a beautiful baby too. 4. Intake of balanced and targeted nutrients. During pregnancy, except for a balanced intake of various nutrients. Mothers can also intake more of nutrients which can make the baby become beautiful according to the actual demand and on the premise of consulting the doctors. Eat more vitamin C-rich foods if you want your baby to have good skin; Eat more foods containing vitamin A if you want your baby have bright eyes; Eat more vitamin B, E-rich foods if you want your baby to have smooth and beautiful hair. 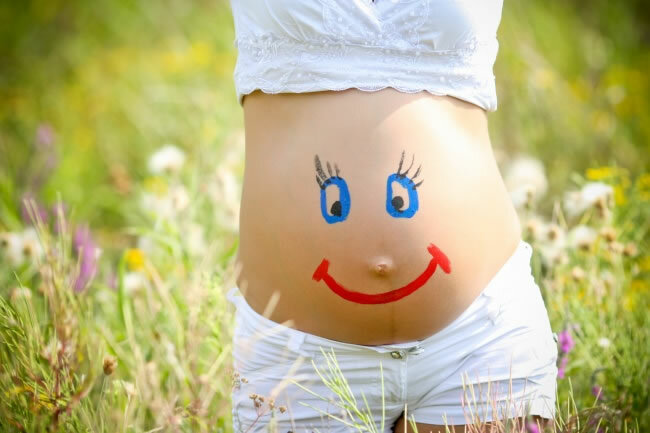 Smiling more during pregnancy, the happy emotions of the mother can be communicated to the baby within the belly. Smile mother will give birth to a baby not only with pretty faces but also with a kind heart. Therefore, during pregnancy, mothers should smile more, which not only can let the baby have a good-looking face, but also can make oneself away from postpartum depression.